Greetings and salutations, everyone; yes, once again it is I, Mani the extremely tiny (yet getting huger) purebred border collie, filling in for the guy I live with, and here to tell you all about my day in the garden. Actually the last two days. You may remember me from such posts as “The First Morning”, among at least a few others. Here I am in a characteristic pose. 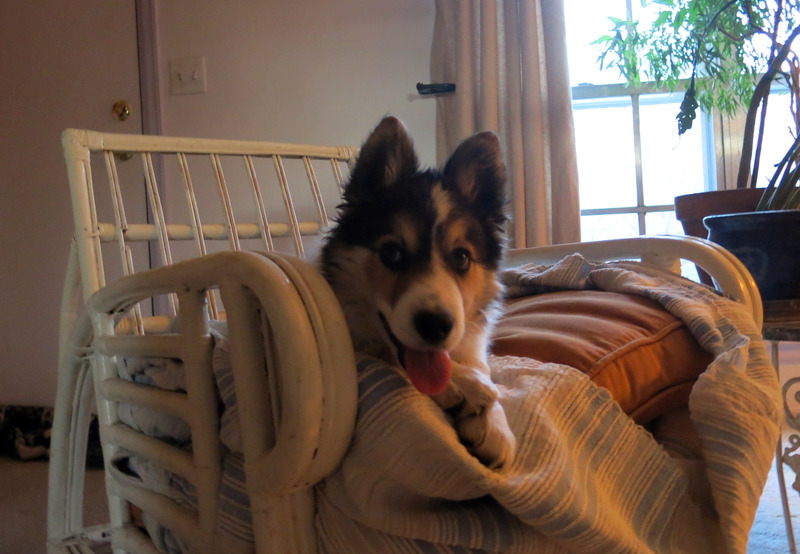 You can see that I’ve torn apart the chair coverings, in my attempt at redecorating. I discovered that the purebred border collie who lived here before me did this sort of thing, so I figured I should too. 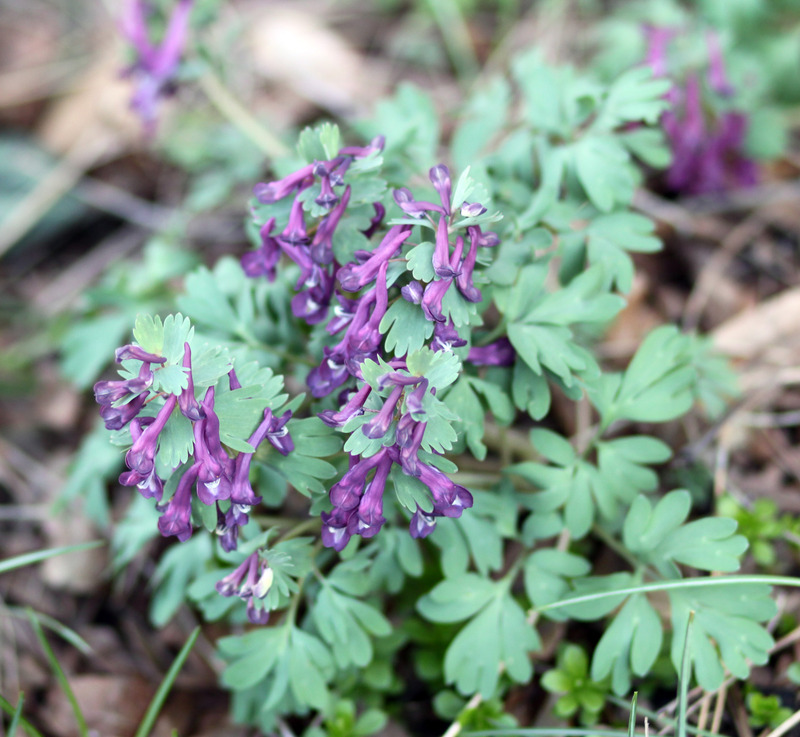 I guess before I spend time talking about me, I should show some flower pictures. Here they are. Okay, now that that’s out of the way, the guy I live with has been sort of desultorily doing stuff in the garden. I’m not sure there’s a plan, in fact I’d say there isn’t one at all. He just decides to do stuff, and then, sometimes, eventually does it. One of the things he decided to do was re-plant the raised bed out in the “way back”, for reasons only he knows. I discovered that there was a hole dug out there, probably by a rabbit, but no one lived in it, so I decided to work on the hole. 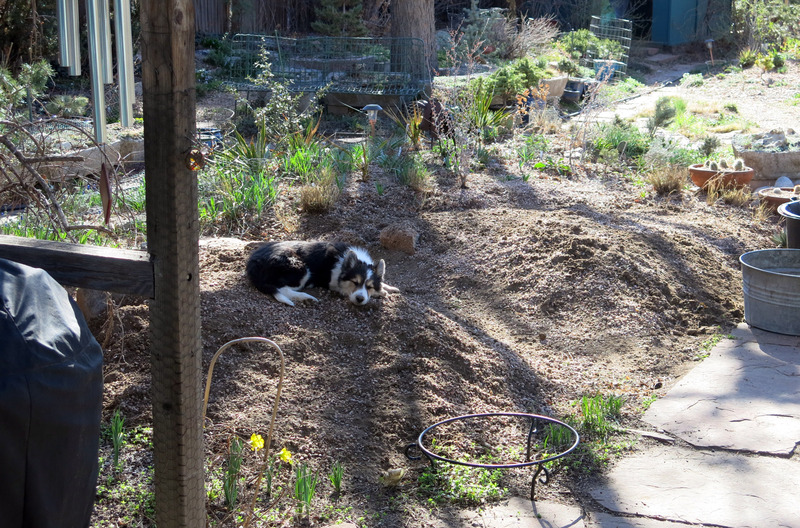 The guy I live with said “border collies don’t dig”, which shows you how little he knows. This is me, here, if you weren’t sure. And that’s the hole. Where the bag is standing used to be a miniature nursery, but now it isn’t, and things are going to look different there. Maybe not much better, but different. The hole was kind of deep. The guy I live with reminded me of the OSHA regulations on shoring holes, and I ignored him. He also said I couldn’t breathe through my ears, so I’d have to be careful. I went to work. This was important work, too, as I’m sure you’ll agree. So you can see that I’ve already proved my value in the garden. I chase rabbits, tell squirrel to get lost, get rid of the ugly plant labels in the garden, and do some digging. I also help hold down the new piles of dirt. I’m very good at this. I guess that’s all I have to say, since we’ve both been so busy, there hasn’t been much time to take pictures or anything. Excellent job little, ever-growing dog. You give new meaning to the term “soil aeration” while at the same time you put a smile on my face. You have so many talents. Yes, I am very impressed with how smart and useful you are. 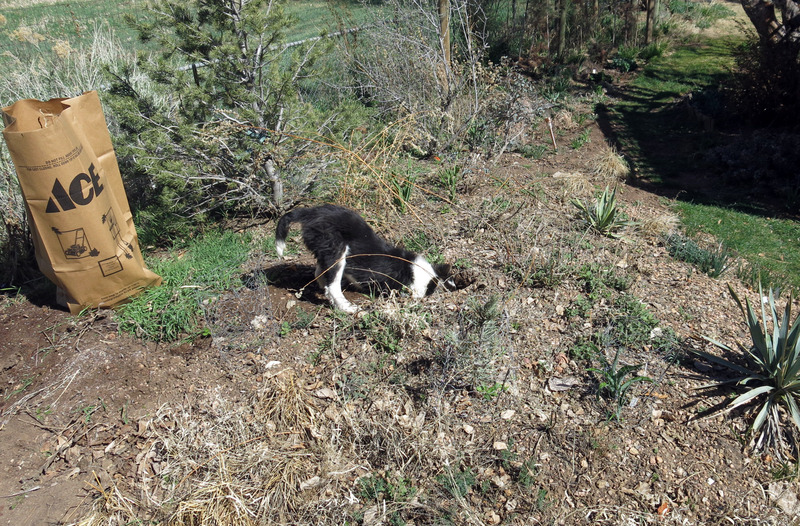 Of course purebred border collies are expert diggers. You have to rescue trapped sheep! I love the iris. Wr painted our building elevator walls that color. People are outraged but I find it soothing as it reminds me of wisteria and iris. The bulbs that we planted last fall at my library are poking through, and the daffodils have buds but no bulbs are flowering. We may get more snow tomorrow. i envy you the balmy weather. Thanks; well, the guy I live with said, this being my first spring, that it can still snow here, and snow a lot. I like snow. He said that they have been having what seems like an interminable winter “back east”. He says the hole is going to be filled up. He’s not very much fun. That is some serious excavating! Around here, we can never find all the dirt again. Where does it go? Did you get any in your nose? And how about that spotless white carpet? Yes, it was serious. There wasn’t much down there, and I did get dirt on my nose, which the guy I live with cleaned off, very carefully, with a wet towel. Because he said I looked like an idiot. I don’t think I think dirt up my nose, because of my ears. (It’s complicated.) The carpet. After the guy I live with’s friend died, he spent the whole winter painting the inside of the house, using low v.o.c. paint, so no one got headaches. Then he decided to get new carpet. He wanted to get the same color of carpet, because he has no color sense, so why not get the same color, and it was installed, and turned out to be blue. Really blue-silver. He freaked out. But we purebred border collies make sure that the color changes over time. Don’t ask me how. I can’t believe how much he vacuums (when he knows I don’t like it), and shampoos the carpet constantly. But anyway, they say if the moon is full, the dirt excavated doesn’t all fit back into the hole, or something like that. Were you digging to China Mani? That’s a mighty big hole to get lost in. 🙂 looks like it tuckered you out tho. I don’t know where I was digging, but a hole is mighty interesting. The guy I live with says that rabbits try to make burrows in the garden, which he forbids, and feels bad about filling them in. Except for this one because it was facing away from the house. Mani, I thought you were very helpful digging that hole just where a shrub is needed in the garden. It’s a shame the guy you live with can’t see that, and that your efforts were wasted. Honestly. How can you have a bad day when there is a tiny-ish pure bred border collie writing a gardening blog in the world? And yes, there is still more Winter headed our way here on Long Island. Snow after midnight, minimum accumulation, but still. Snow. Mani, you are my Spring. I have a feeling that TGYLW says the same thing. Thanks; yes, I think he does think that. Do you suppose winter will ever end “back east”? The guy I live with explained that cold temperatures and winter travel eastward across the continent, and that there’s something called an “NOAA chart” that shows that. This being my first spring, I should say it’s not too bad. It’s 74F (23C), eleven percent humidity, and I’m chewing on a pine cone, out on the patio rug specially put down, so I hear, for border collies. 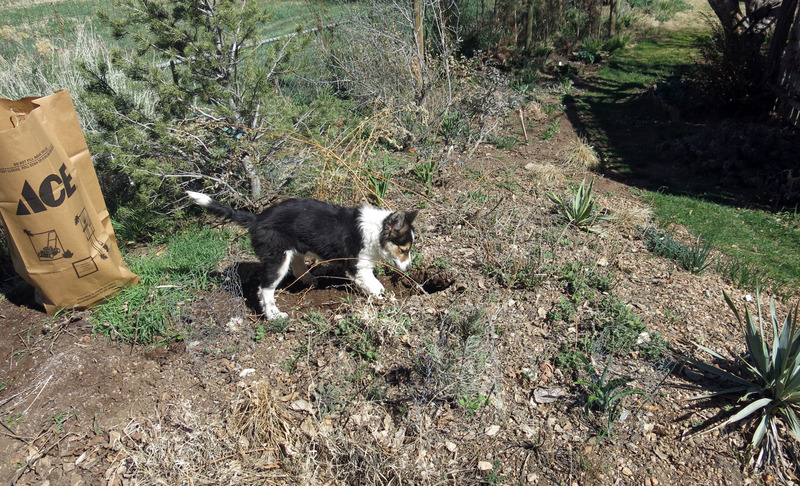 Toby loves to try to dig out the moles/voles that have invaded the yard. Must be the Pit/Rott/Lab mix thing. Oh, the first border collie who lived here went after voles like crazy; he hated the idea of having them in his yard. It annoys Toby’s daddy no end. Which is worse: vole holes or dog-digging with no hope of catching one? We’re trying a sonic device this year vs poison or those horrible kill traps. The guy I live with says that blood meal sprinkled near the tunnel entrances will send them away. Available at garden centers; also a scentless version called Plantskydd (not pronounced like it’s spelled) is available too. Oh, honey, you may be a puppy, but no longer tiny. Um, maybe longer. And tell me, is there such a thing as a *modest* purebred border collie? 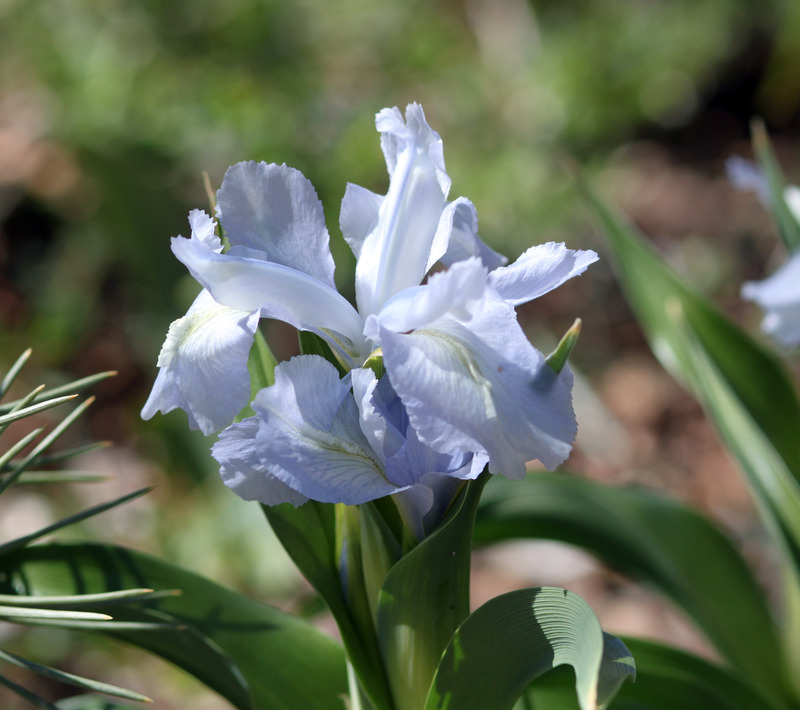 Ever in the history of the world and gorgeous iris? I’ve often wondered about that carpet’s pristine state, and now your description of The Guy’s activities explains much. There might not actually be such a thing as a modest purebred border collie, except maybe for ones that the world doesn’t revolve around. Maybe I’ll tell the story of the vacuum cleaner and the shampoo attachment sometime. Though I find the whole thing quite frightening. I’m back. It’s 34 degrees here on Long Island. I’m at my breaking point, dealing with this interminable Winter. And then I remembered that there is a pure bred border collie of unbearable cuteness just a Bookmark away. To Kill a Mockingbird is still my favorite movie, but Diggin’ with Mani is a very close second. You know what they say: “Dying is easy. Comedy is hard” , and you, Mani, make me laugh even on a 34 degree morning in air-quote Spring, un-air-quote. Thanks; the guy I live with told me that winter “back east” has been interminable. It’s supposed to snow here tonight, if that’s any comfort. Yes, week after week of temperatures in the 70s, then snow. Denver. The guy I live with’s favorite movie is either The Birdcage or Planes, Trains, and Automobiles.